A LEADING renewable energy organisation with links to Stormont published news of plans to tighten the lucrative Renewable Heat Incentive (RHI) scheme before the official announcement was made by government, The Detail has learned. Action Renewables is described as the leading organisation promoting renewable energy in Northern Ireland and was founded in 2003 in partnership with the then Department of Enterprise, Trade and Investment (DETI) which went on to fund it for four years. A senior civil servant yesterday claimed the energy industry had advance knowledge of government plans to impose a tariff on the RHI scheme, at a time when a spike of around 900 applications was made before the funding restrictions were imposed. Now it has emerged that a note appeared on the Action Renewables website titled “Changes ahead for non-domestic RHI”, which read: “In the coming days DETI are expected to announce a number of changes to the existing Northern Ireland Non-Domestic RHI. "Changes are likely to include the 100kW biomass band changing to 200kW, and the introduction of a 2 tier tariff system, like the one currently in action in GB. We await official announcement on these, and any other potential changes." The coding on the webpage carries the date September 1, 2015, which was seven days before government announced the change. 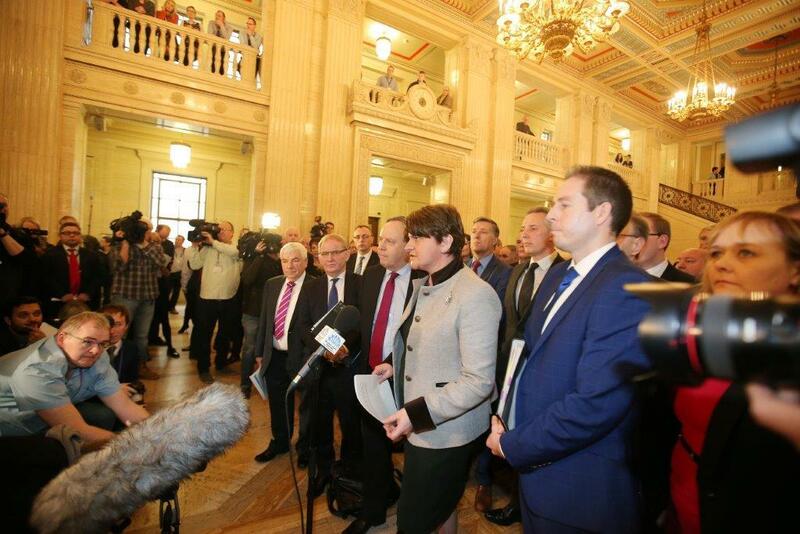 A week later on September 8, 2015, changes to the scheme were unveiled by the then Enterprise Minister Jonathan Bell, who had taken over the ministry previously held by current DUP leader Arlene Foster. There is no allegation of wrongdoing against Action Renewables, but The Detail asked it to explain the wording of the note on its website, which indicated advance information of the RHI reform. A spokesperson for Action Renewables said: “The information posted on our website is a reflection of information which was being circulated in the industry at that time. “Action Renewables picked the information up from a tweet, made by a renewable energy installer. The botched green energy initiative could cost Northern Ireland’s public purse over £400million after the failure to cap subsidies, despite caps being applied to the version of the scheme in Britain. Additional costs from the Northern Ireland RHI scheme will also affect central government coffers in Westminster, threatening to push the total burden to taxpayers to over £1billion. Sinn Féin deputy First Minister Martin McGuinness resigned from office last week - collapsing the Assembly and forcing an election - after First Minister Arlene Foster, who denies any wrongdoing, refused to step-aside for an inquiry into the RHI scheme that was created during her time as Enterprise Minister. Former DUP Special Ministerial Adviser (Spad) Stephen Brimstone is confirmed as being a beneficiary of the RHI scheme, while The Detail reported that his brother had been linked to the scheme. A current DUP Spad John Robinson – who was the party’s longstanding Director of Communications before last year becoming adviser to DUP Economy Minister Simon Hamilton – had denied recent allegations linking him to the scheme. He subsequently confirmed his father-in-law is an RHI beneficiary and Mr Robinson has now announced he will step back from Minister Hamilton’s ongoing work on the RHI crisis. The party had confirmed a further DUP Spad, Andrew Crawford, had a brother who was a RHI recipient. Yesterday senior Stormont civil servant Andrew McCormick, who heads the economy department, told the Assembly’s Public Accounts Committee that a DUP Spad had a role in influencing the decision to delay closing the costly element of the scheme. When pressed, he identified DUP Spad Mr Crawford, though the civil servant said he had no direct evidence. Mr Crawford denied any attempt to prevent the RHI costs being curbed. He said he would only have offered “informal advice” on the basis of his experience of DETI, where he served under Mrs Foster when she held that ministry. However, in a further development this afternoon, Mrs Foster announced that Mr Crawford had resigned from his current role as DUP ministerial adviser in the department of agriculture. She said he felt he was becoming a distraction from the work of his minister and was "becoming the story". Dr McCormick, Department of Economy Permanent Secretary, had said he was making no suggestion that Mrs Foster became involved in keeping the costly scheme open. He also told the committee that departmental plans to tighten the scheme had leaked out: “Around the period of July there is evidence of some premature information being made available to the industry and some documents appeared with me anonymously after Christmas and this needs further investigation. “I’d prefer not to say too much about these because I don't want to prejudice the investigation, but the consequence is very serious because this shows that there was premature awareness of the potential for the tariff to be reduced. The information revealed by Dr McCormick is said to have related to July 2015. Action Renewables, which is now registered as having charitable status, said it had not received information from Stormont ahead of the tariff change. But the group’s comments today, regarding knowledge within the wider industry, supports Dr McCormick’s concerns over leaks. In its first three years of operation the RHI scheme had around 900 applicants, but in a period of weeks ahead of the tariffs being applied on November 18, 2015, the RHI scheme received a further rush of around 900 applications. Action Renewables has played a prominent role in the energy sector and, for example, assisted the Assembly’s All Party Group on Renewable Energy, set up in 2012. Action Renewables director Michael Doran is today giving evidence to the Assembly’s Economy Committee as part of the Renewable Heat Association (RHA), formed to represent renewable heating businesses in the face of the RHI crisis. In a previous submission to the Assembly, Action Renewables said it was set up in 2003, in a partnership involving Department of Enterprise, Trade and Investment (DETI). The renewable organisation said that for the first four years of its existence it was "fully funded by DETI", but that financial support was gradually reduced and ended from the April 1, 2011. It is registered with the Northern Ireland charity commission.